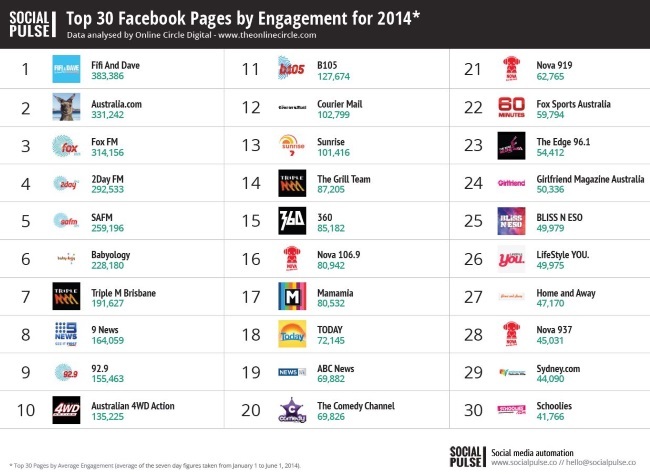 What Were Australia’s Top Facebook Pages In The First Half Of 2014? The top Facebook page in Australia in terms of engagement in the first half of 2014 was “Fifi and Dave,” while Tourism Australia topped the land Down Under in terms of likes, according to the latest Australian Facebook Performance Report by Online Circle Digital for Social Pulse. Radio was the top industry in terms of engagement in the first half of 2014 in Australia, while TV shows garnered the most total likes, and news and magazines posted the most growth in likes. Australian thumbs-up image courtesy of Shutterstock.